Hunting is serious business. If your optics haven’t been specifically designed with hunting in mind, can you trust them when the time comes to take the shot? 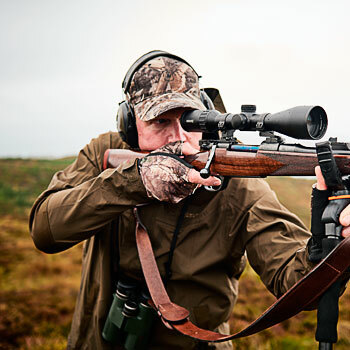 The Endurance line of scopes feature chassis and reticle designs that have been explicitly engineered for everything from varmint to big game hunting. Our brand new Wide Angle optical system boasts a stunning field of view aimed to give you the best sight possible, while keeping an important 4 inch/102mm eye relief. Built into a 30mm chassis the Wide Angle optics are available in either fixed 100 yard/91 metre parallax or side focus models. All 30mm models feature a specialist erector system, maximizing internal stability. The Endurance family also showcases unique ballistic reticle designs. The new LRC reticle provides aim points to match centrefire ballistics, simply choose the magnification to suit your cartridge. The Marksman reticle takes advantage of the shared ballistic profile of the popular .223 and .308 varmint and big game rounds to deliver out-of-the-box accuracy with aim points out to 700 yards/640 metres. If metric measurements are preferred, simply reduce the magnification to suit. Precise Side Focus adjustment to infinity ensures accuracy is maintained. The rheostat operates brightness settings for the red reticle illumination. Wider than ever before, the Endurance Wide Angle optical system creates a breathtaking image that gives full edge to edge clarity. Seeing is believing. The apparent field of view is complemented further by a fine outer ocular assembly, making the enlarged target image almost float in front of your eye. Low profile ‘no-snag’ fingertip turrets with caps are precision engineered to deliver consistent and repeatable 1⁄4 MOA click adjustments. Push-pull locking and resettable turrets with positive clicks. Two variants – 1⁄4 MOA with 15 MOA per revolution or 1/10 MRAD with 6 MRAD per revolution. The rheostat operates reticle illumination in red. A multi stage brightness control allows a range of settings to suit shooting from dawn until dusk.